The present study measured arsenic (As) concentrations in soil, groundwater and rice grain samples in two villages, Sarapur and Chinili, under Chakdaha block, Nadia district, West Bengal, India. This study also included a survey of the two villages to understand the knowledge among villagers about the As problem. Soil and groundwater samples were collected from fields in two villages while rice grain samples were collected from villagers’ houses. 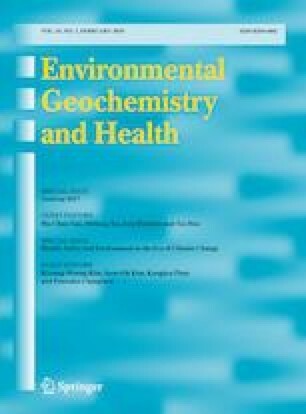 The results revealed the presence of As in higher concentrations than the maximum permissible limit of As in drinking water (10 µg L−1 and 50 µg L−1 by WHO and Indian standard, respectively) in groundwater [124.50 ± 1.11 µg L−1 (Sarapur) and 138.20 ± 1.34 µg L−1 (Chinili)]. The level of As in soil was found to range from 47.7 ± 0.14 to 49.3 ± 0.19 mg Kg−1 in Sarapur and from 57.5 ± 0.25 to 62.5 ± 0.44 mg Kg−1 in Chinili which are also higher than European Union maximum acceptable limit in agricultural soil (i.e. 20 mg Kg−1). The analysis of As in rice grains of five varieties, collected from residents of two villages, showed the presence of higher than recommended safe level of As in rice by FAO/WHO (0.2 mg Kg−1). The As concentration order was Gosai (0.95 ± 0.044 mg kg−1), Satabdi (0.79 ± 0.038 mg kg−1), Banskathi (0.60 ± 0.026 mg kg−1), Kunti (0.47 ± 0.018 mg kg−1) and Ranjit (0.29 ± 0.021 mg kg−1). Importantly, Gosai and Satabdi were the most popular varieties being consumed by local people. The data of consumption of rice per day in the survey was used for the measurement of average daily dose and hazard quotient. It was seen that the As hazard was negatively correlated to the age of residents. Therefore, children and toddlers were at higher risk of As exposure than elderly people. In addition, people with skin related As toxicity symptoms were also cited in the two villages. The study emphasized the severity of As problem in remote areas of West Bengal, India where people consume As tainted rice due to lack of awareness about the As problem and associated health issues. The online version of this article ( https://doi.org/10.1007/s10653-019-00289-4) contains supplementary material, which is available to authorized users. The authors are thankful to IISER-K instrumentation core facility. We are highly indebted to Mr. Anshuman Dash a local farmer from Nadia, West Bengal, who helped us to collect the samples and gather personal information about natives in survey. We are also thankful to all other villagers who gave us their precious time directly or indirectly to participate in our survey and in collection of the rice and water samples from their houses. MKU is thankful to Banaras Hindu University for providing Ph.D. fellowship. AB is thankful to CSIR-UGC for SRF fellowship. AM and SB are thankful to MoES [MoES/P.O. (Geosci)/56/2015] for JRF fellowship and project grant for funding, respectively. Funding was provided by Science and Engineering Research Board (Grant No. YSS/2014/000080). Census of India, West Bengal. (2011). District census handbook, Nadia (Series-20, Part XIIB). http://censusindia.gov.in/2011census/dchb/1910_PART_B_DCHB_NADIA.pdf Accessed March 17, 2019.